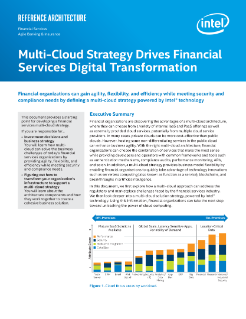 Financial organizations are discovering the advantages of a multi-cloud architecture, where they can choose from a variety of internal IaaS and PaaS offerings as well as externally provided cloud services, potentially from multiple cloud service providers. In many cases, private clouds can be more cost-effective than public clouds. However, hosting some non-differentiating services in the public ...cloud can enhance business agility. With the right multi-cloud architecture, financial organizations can choose the combination of services that make the most sense while providing developers and operators with common frameworks and tools such as authentication mechanisms, compliance audits, performance monitoring, APIs, and so on. In addition, a multi-cloud strategy provides business model flexibility by enabling financial organizations to quickly take advantage of technology innovations such as serverless computing (also known as function as a service), blockchains, and breakthroughs in artificial intelligence. In this document, we first explore how a multi-cloud approach can address the regulatory and marketplace challenges faced by the financial services industry. We then look deeper into a multi-cloud solution strategy, powered by Intel® technology. Using this information, financial organizations can take the next step toward unleashing the power of cloud computing.